The Crazybaby Air are simply too buggy to recommend. The poor Bluetooth connection, terrible battery life, and usability quirks make the Air a truly frustrating true wireless headphone to use. We loved the design and comfort ... but they’re not enough to make up for an under baked product. It’s increasingly difficult to stand out in a sea of truly wireless headphones. Just about every audio manufacturer has gotten into the true wireless headphone game, which is only making it harder and harder for consumers to choose. So how do you stand out in a crowded market? For Crazybaby, the answer is design. The Air look like truly wireless earphones that Apple could have made. Their design is creative, and polished with an aluminium pill-shaped charging case and smooth white earbuds with a soft blue pulsing status light. However, design is just about the only thing that the Air by Crazybaby can stand on. These headphones are awful in use with bass-heavy sound, constant stuttering, bad call quality, and battery life that doesn’t get close to the claimed 3 hours. Ultimately? These are half-baked truly wireless headphones you’ll want to stay away until Crazybaby comes out with an updated version. We love the design of the Crazybaby Air. The headphones come in an aluminum pill-shaped charging case which look straight out of Star Trek. You access the headphones by turning the top of the case anti-clockwise and by pulling out the tray. On the bottom of the case you’ll find a USB-C charging port, which we hope to see more of from other wireless headphones. Our test unit came in a nice white but the headphones are also available in gloss black. The headphones themselves look like polished pebbles, which makes them slippery to hold but extremely comfortable in the ear. Not only were they comfortable, but we were also impressed by the noise isolation of the Air. If you're a fitness enthusiast, the company also includes “sport” sleeves for the earphones if you plan on being active with them and you won’t have to worry about getting them wet as they’re IP66 water and dust resistant. 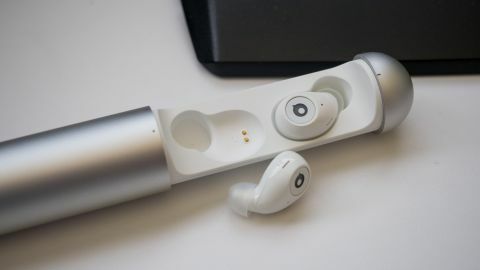 On the earbuds themselves you’ll find a single button that’s used for power, controlling music playback, calls, and activating your voice assistant. One annoying thing about the Air is that the headphones don’t turn themselves on when you remove them from the case, which just about every other true wireless headphone does. Additionally, the controls are extremely confusing as Crazybaby decided to have specific controls mapped to each earbud. This means the left earbud can only control calls and your voice assistant while the right earbud controls play/pause, skip, and previous tracks. It’ll take some time to remember which earbud does what, but that in and of itself isn't a deal breaker. What is a deal breaker, though, is the poor connection between the earbuds: Throughout our month of testing, the Crazybaby Air constantly disconnected the right earbud for half a second at a time. We would simply turn our head one way and the headphones would stutter, creating an extremely frustrating listening experience. We also ran into issues where the right earbud would not wake from sleep no matter what. If you're looking for a reason to keep your wired headphones for another year, these are it. That said, in terms of sound, the Crazybaby Air aren't awful ... if you like a lot of bass. For our tastes, we wanted more balance as the Air blurred the details in tracks. Because of this warm tonal balance, the headphones never sound harsh but we kept wanting more detail across the frequency range. Battery life is a claimed 3 hours, but we never saw close to that number. On average, we got about an hour and a half from a single charge, which wasn’t enough to get us through one way on our commute, leaving us music-less the last 5 minutes on the walk to work. Making things worse is that the Crazybaby Air doesn’t give you a low battery warning until it’s too late: When you hear the low battery chime, you have 60 seconds before the headphone shut themselves down. The $170 (about £125, AUD$225) Crazybaby Air are an unfinished product that we can't recommend to anyone, especially with the solid alternatives on the market - both the Jabra Elite Sport and NuForce BE Free8 are much better choices and cost less than the Crazybaby Air. For the audiophile on the go and frequent travellers, the Sony WF-1000X with active noise cancellation are an excellent choice. For now, we'll just have to wait until these headphones hit adulthood.